A rake-like device that sweeps up cells could give new life to arthritic knees. It collects stem cells — which can form new tissue — from the joint lining, then brushes them into blood clots to help the knee heal itself. New research from the University of Leeds shows the treatment increases the number of repair cells in the area by a hundredfold. It also found that a conventional procedure for knee damage, called arthroscopy — a keyhole procedure to examine and clear out any damage — may actually clear out the cells it needs for repair. In a healthy joint, cartilage provides a low-friction surface to allow smooth joint movement. But wear and tear and knocks take their toll, and cartilage can become damaged, leaving bone rubbing on bone, causing the pain and loss of movement associated with osteoarthritis. In severe cases, a total knee replacement is needed, but in more common mild to moderate cases, a range of other approaches are used, including painkillers, knee braces and arthroscopic procedures. One technique, microfracture, involves using a drill or pick to make small holes in the bone surfaces inside the joint to encourage new cartilage to grow. The stem cells that are released are thought to be trapped in blood clots, contributing to the repair of the cartilage. But one of the problems is that it had been thought the number of repair stem cells in the knee is low. The Leeds team discovered that the synovial fluid, an egg white-like lubricant within joints, contains stem cells. Blood jabs can reduce the pain of knee arthritis — and the effect lasted longer than steroid injections, a common treatment, reports the journal Orthopade. Around 120 patients were given injections of platelet-rich plasma (PRP), steroids or hyaluronic acid, a joint lubricant, in their knees. PRP is derived from the patient’s blood, which is treated so it has much higher concentrations of platelets, which contain growth factors important for healing. All helped, but the research by Jinan University, China, showed that PRP was effective for longer. Further research also showed that this fluid stopped stem cells sticking to injured cartilage and also that surgical procedures inadvertently wash away these cells. A device was then developed to release lots more stem cells from the joint lining. 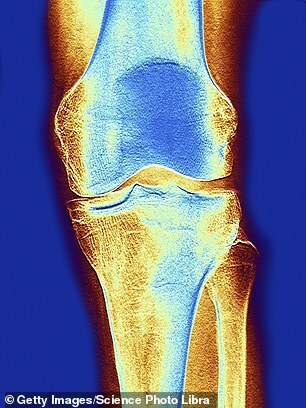 Following lab tests this is now being tested on patients with knee arthritis. The new procedure on trial involves creating a microfracture, which results in a clot — and then stem cells are collected by raking them into the clot with the specially designed device inserted through a small hole made in the joint. In a recent report in The American Journal of Sports Medicine, the Leeds researchers found that the brush resulted in a 105-fold increase in the number of stem cells. The new trial will involve 20 patients undergoing microfracture — half will also have the stem cell treatment.